This might not be too much of a problem for everyday users but for first time users, it sure is and I for one have fallen victim to this confusion before. 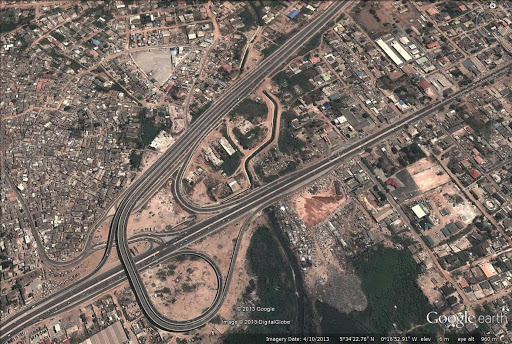 If you are driving towards Mallam interchange from the Awoshie area along the highway for the first time and you are suddenly confronted with the interchange, how do you decide which of the three lanes to take especially at the kinds of speed that the highway affords its users. 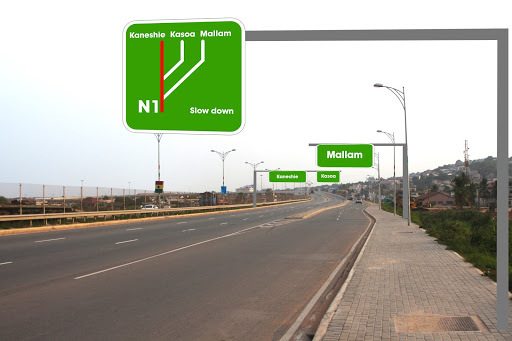 There are three main lanes, one to the far right which goes down the interchange to to Mallam proper which you are first confronted with. A few meters from that, there is the middle right lane which takes you up the interchange and down to meet the Winneba road towards Kasoa, then there is the left lane which takes you up the hill and down in the opposite direction Towards Kaneshie. Well! I am able to describe it so well because I am an everyday user but for the first time user this is usually a confusing decision to make at high speed since there is absolutely no way of telling which of the lanes goes where while a wrong decision means that you end up going towards Kasoa when you intended to go to Mallam or vice versa or going towards Kaneshie when you intended to go to Kasoa or vice versa. In the second pair of cases especially, you have to travel close to another kilometre in order to make a legal U-turn. This is a recipe for disaster and I would not be surprised at all if there have been some accidents recorded there already due to motorists attempting to make the right turn in the last minute at such high speeds. Below is a short animation to illustrate the point. Take note of the white SUV with the red arrow on top. Short animation to illustrate the point. Take note of the white SUV with the red arrow on top. In the video above, a first time driver takes the middle lane that take you over, then down towards Kasoa. Notice there are no signs to indicate which lane to take so the passenger who is obviously familiar with the place has to warn him in advance. Well! This situation calls for a very simple intervention and once again I stress that it does not involve rocket science. In fact, I’m tempted to believe that it is only due to negligence that this has not been done already and it would be very sad if anybody has had to, or will have to lose his or her life due to such negligence. A simple road sign should do the magic and prevent needless accidents. Here is an illustration of what I mean.